Libbey grew up in Sydney, educated by the Sisters of St Joseph and the Sisters of Charity. Her mother had been raised in Newcastle so the Hunter region is familiar to her. She taught in Catholic secondary schools before joining the congregation. The Sisters were the first women religious in Australia, arriving in 1838 and ministering initially to convicts in ‘female factories’ in Parramatta and Hobart. This led to teaching the children of convicts and later, establishing medical services that were the foundation of St Vincent’s Hospitals, now under the banner of Mary Aikenhead Ministries which the congregation set up to continue the governance of its ministries in perpetuity under lay leadership. Now there are different needs – including parish ministry and adult faith formation, particularly in isolated areas. Having studied theology and worked in Special Religious Education, sacramental formation and congregational leadership, as well as completing a Master of Arts in Pastoral Ministry and Spirituality at Boston College, Libbey is well qualified to walk with people and offer opportunities to grow in faith, understanding and community. She brings with her ministry experience in the Archdiocese of Melbourne and the Dioceses of Wollongong, Parramatta and Broken Bay. Libbey works with others to prepare the parish liturgies and the communities are served by sacramental ministers, Fathers Kevin Kiem and Phil Doyle cssp of Raymond Terrace, as well as occasional visiting priests. For the recent Triduum (Easter liturgy) she ensured that members of each Mass community were prepared for ministry and that all was in readiness. While the Eucharistic liturgy is the domain of the ordained minister, there are other liturgies, including those at local aged care facilities, some ecumenical, all of which need to be prepared and co-ordinated. On a lighter note, old-fashioned movie evenings are popular. A thought-provoking film is accompanied by sandwiches and sausage rolls, and afterwards, there are Jaffas and Fantales. Cathie Henry and her husband Robert are relative newcomers, choosing a sea change from Kurri Kurri to Tea Gardens. Cathie is committed to the parish community and says, “We are very fortunate to have the strong leadership skills of Sr Libbey, who displays a genuine feeling of community. Like all parish leaders, Libbey’s ministry is guided by the five pillars of the diocese: Mission & Outreach, Formation & Education, Worship & Prayer, Leadership & Structure, Identity & Community. The scope of her ministry is limitless – but then again, she’s not doing it all by herself, she’s leading her people. There is a parish pastoral council and a team attached to each Mass centre. 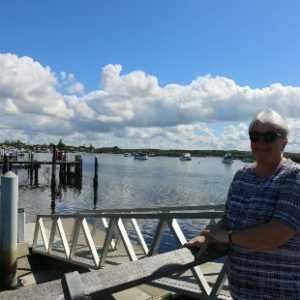 Like her predecessor, Sr Margaret Valentine rsc, Libbey is passionate about using her God-given gifts to strengthen and encourage the People of God on the Myall Coast to live lives infused by faith and enriched by belonging to a faith community. The Church that many knew as younger people is different − smaller, hopefully humbler − but always, God’s pilgrim people.